Custom wallpaper projects featuring Asian imagery are some of our most popular sellers. Be it a wall mural featuring bamboo forests, Zen rock gardens, or alphabetic characters, there are plenty of options for you to choose from. We offer a full line of Asian inspired wall murals on our main website, Great Wall Online. There, you'll find an assortment of wall mural imagery that is very environmental in focus. The wallpaper wall mural we're featuring in the inspiration room focuses on a detail of a Chinese tile wall mural. 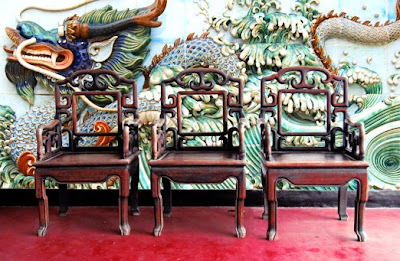 The colorful tiles combine to create a dragon in blues and greens with accents of red, which help tie the mural into the room, pulling out the red hues of the ornate chairs. Your own photographs of a trip abroad would certainly be worth while considering. A scenic shot like the Asian inspired wall murals on our site would work well, or go for a more idiosyncratic look with a mural that features a detail or element from a photo that interests you. If you don't have the right image but you can envision the wall mural you want, contact us and we can assist you with image research. Hi nice blogging thanks for showing the cool stuffs out there..